These job fairs are organized by colleges mainly for their students and alumni, but sometimes they are open to the general public as well. Colleges put on general job fairs, which include a wide selection of employers and professions. Before you go and attend a general job fair, find out which employers will be present and if they are interesting to you! In addition to the general job fairs, colleges often organize fairs specific to certain professions: e.g. health care careers, engineering, media, or skilled trades. These are preferable to the general fairs since you know each employer present has an interest in hiring candidates from your field. In general the employers present at college career fairs are mainly interested in entry-level and recent graduate candidates. Though alumni are usually invited as well, there will be fewer opportunities for mid-career candidates. However, talking to a live human recruiter or hiring manager is always preferable to just applying online. So the chance to talk to hiring managers directly, learn information about the company and making connections might make it worthwhile for mid-career professionals to attend. These are often organized by local non-profit organizations, media outlets or workforce centers. They are unfocused and represent a wide variety of employers and fields. Often the majority of employers present at these general fairs are from companies or fields with high turnover jobs who need new employees frequently. These occupations are often found at the lower paying level of the world of work. If you need a job fast and are not picky, these job fairs might work for you. If you are an experienced professional, do your research and find out beforehand which employers will be present to see if it is worth your while to attend. A drawback that college and general job fairs have in common is that some of the companies present are not really actively hiring. Sometimes they attend more for the public relations value. They want to be seen as thriving companies that are attractive to potential employees. Yes, they will still take your resume at the job fair but it will not lead to anything. These are the best job fairs. As the name suggests, this is a job fair for/with just one employer who is normally looking to fill a number of different positions. These are the best job fairs because the companies conducting them are in need and actively looking for people. They are usually very organized and ready to interview and process applicants on the spot. This means that there is very little time between the job fair and starting a new position. Single employer job fairs are conducted by companies in all fields, from high tech and IT, to warehouse, healthcare and hospitality. The career center can help! The best way to find out about any kind of job fair in your area is social media. Follow any company you are interested in on social media. They will normally announce their job fair participation on their different accounts. Also follow your school’s career center social media as well as your local workforce or unemployment center, Dept. of Labor and public library. For the Greater Baton Rouge area the Career Center at the East Baton Rouge Parish Library is your one stop shop. We post all upcoming job fairs on our social media, we frequently host them, and we help you prepare for an impeccable job fair performance with our Job Fair Success seminars, like this one. If you’re a savvy job-seeker, you already know that social media is a crucial job search tool – for establishing your personal brand, expanding your network, and discovering the hidden job market. But what you may not know is, there is a new tool you can add to your social media job search toolkit. 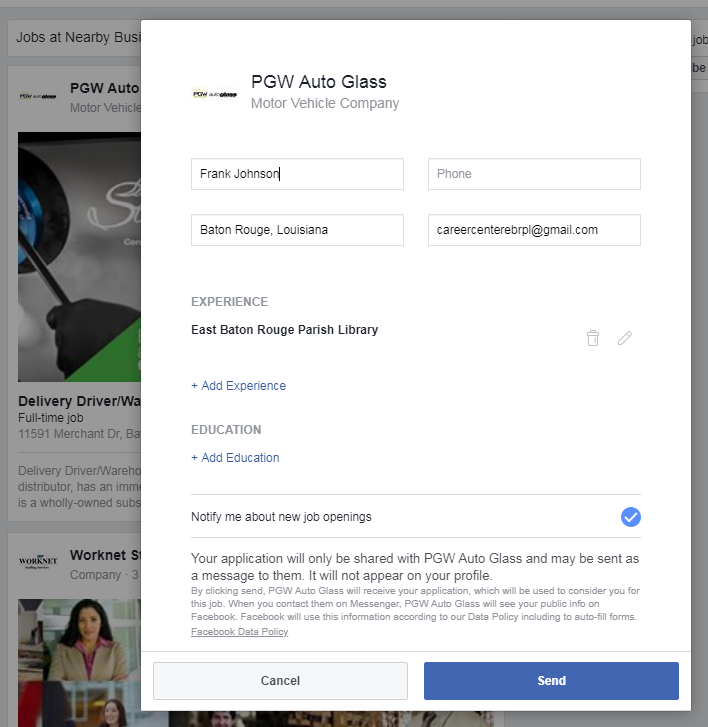 Facebook has recently launched Facebook Jobs, an app which allows you to find and apply for jobs directly through Facebook. 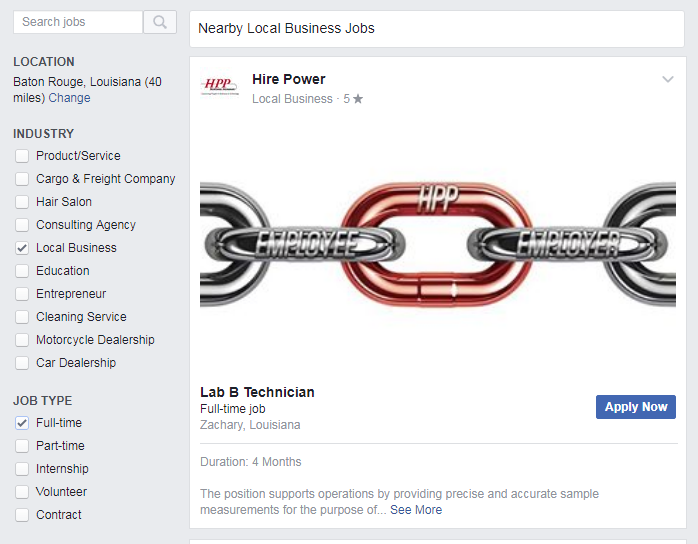 Depending on what search terms you use, you will see “posts” for job openings in your Location area, Industry, and Job Type. If you see a position that interests you have the option to click on Apply Now – but you might not want to. 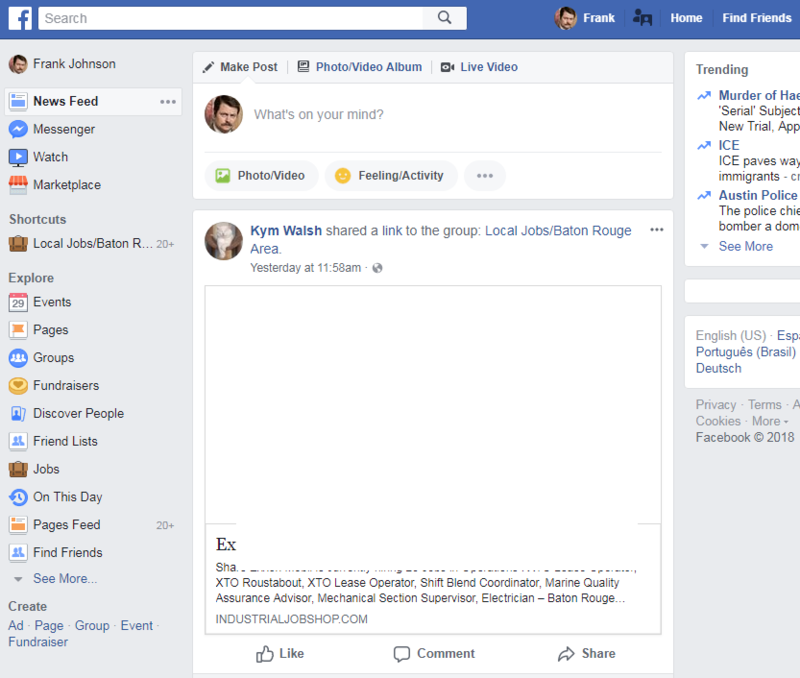 The Facebook Jobs tool has one great advantage, which is that it makes it very easy and convenient for you to look for a variety of jobs at once. Much like aggregate job posting sites such as Indeed, it’s a time-saving one-stop shop for job searchers. But once you find a job you’d like to apply for, we recommend that you do not actually apply for the job through Facebook itself (unless that is the only option). We strongly recommend that you go to the company’s official website and apply there instead. We have two major reasons for this recommendation. First, many people see Facebook as a place of play, not a place of business. Submitting your application that way may cause you to be taken less seriously, especially if the application links directly to your personal Facebook page – which is probably much less polished and professional-looking than your resume or LinkedIn profile. Second, there is always a risk that you will be sharing your information with a suspicious source. There are a lot of scam artists who lure in victims with fake job offers, and Facebook may not be able to thoroughly vet them all. Thus, the company’s official website is the safer bet. Again, we recommend that you don’t do this, and use the company’s official website instead. However, sometimes that’s not an option. If the job can only be applied for on Facebook (and you’re certain that it’s legitimate), click “Apply Now” on the job posting. This opens up a rudimentary job application form where you can provide contact information, education, and experience. There is also an option to be notified by that organization about other job openings. 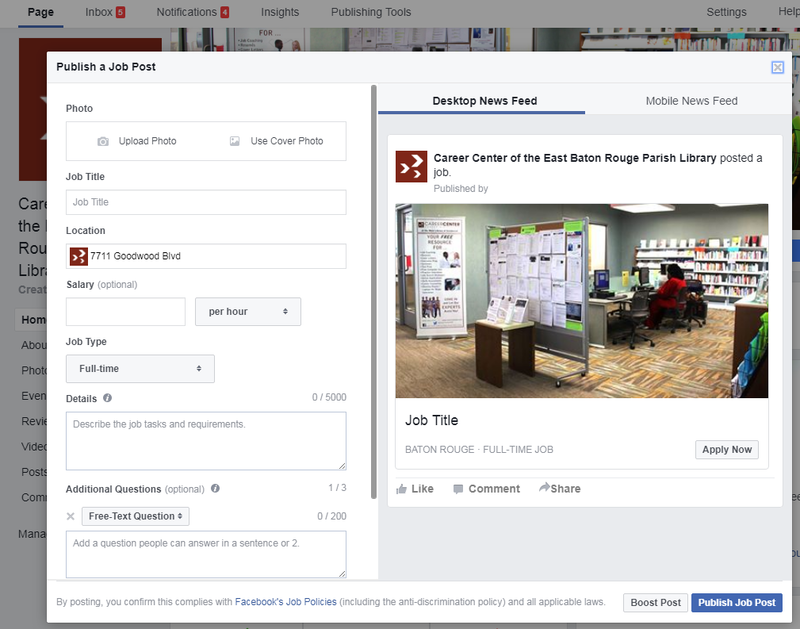 If you run a small business with a corporate Facebook page, you can use the Facebook Jobs tool to advertise your job openings. This may be a good way to expand your pool of applicants, because far more people will see your openings here than on your company website. Once you log into your corporate page, there is a button for Publish a job post. That opens a form on which the organization can post the open position with places to add information about Job Title, Location, Salary, Job Type, Details, Additional Questions, and a Photo if desired (such as a business or company logo). 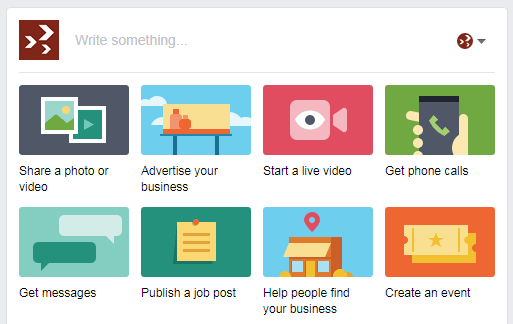 Whether the Facebook Jobs tool is useful to you will depend on your needs and circumstances. If you have highly specialized skills, or if you are only interested in a handful of companies, this tool may not help you find what you’re looking for. If, however, you’re not completely sure what you want or where to find it, this tool can be a great way to look at a large variety of local job listings with a minimum of fuss. We saw lots of openings for retail, food service, caregiver, and labor positions, but there’s a little of everything and a few off-the-wall postings you’d have trouble finding elsewhere. In general, we think it’s a good tool to help both companies and job-seekers. The Career Center recently added a new resource to its website: a job search quiz. This 20-question, true-false quiz will test your knowledge of general job search techniques, interviewing, resume-writing, and networking. 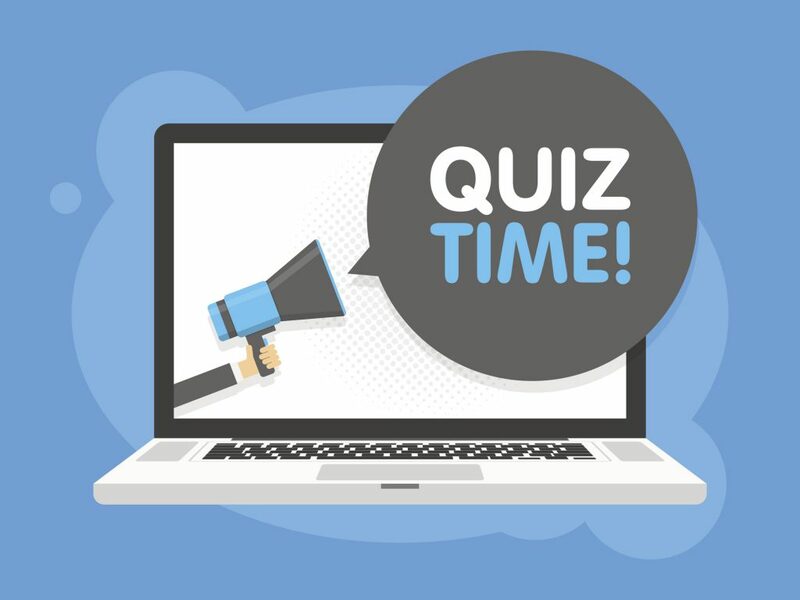 The quiz’s most helpful feature: after your test is scored, you will be provided with detailed explanations for each question. These explanations will help you become a savvier job-seeker and increase your likelihood of success landing a great job. You may take the quiz here or on the Job Search page of our website. As always, if you would like further assistance with any aspect of your job search, contact the Career Center at 225-231-3733. No commute, no dress code, no office politics, and more flexibility. That’s what attracts most people to look into working from home. Thanks to technological advances, work-at-home opportunities are more plentiful than ever before. But how to find the best opportunities? How do you beware of scams? And is working from home really as good as it seems? While the before mentioned advantages are real, there are distinct disadvantages to working from home as well. 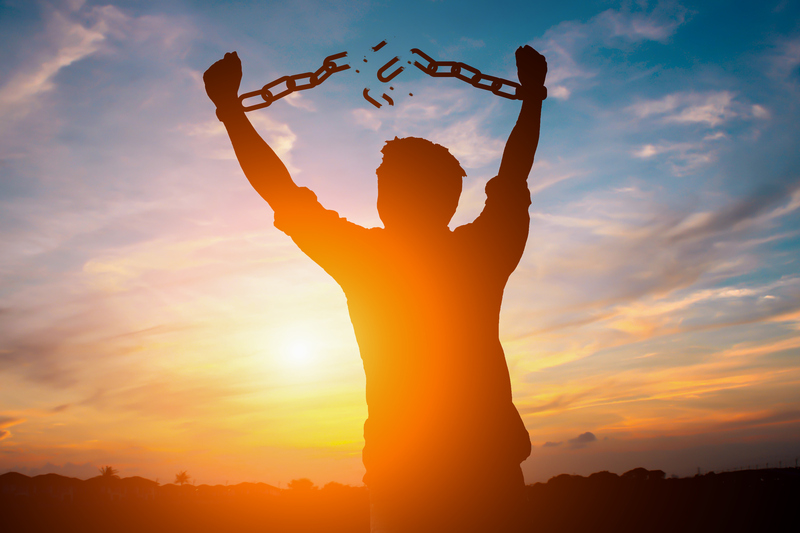 Do you have the self-discipline not to give in to the distractions of being at home, such as surfing the web, doing housework, reading a book, or talking to friends? Are you okay with no person-to- person interaction all day? Many jobs feature interaction through chat, phone, or video call, but it’s still not the same as being around others in person. There are also no clear limitations between being “at work” and “at home”. 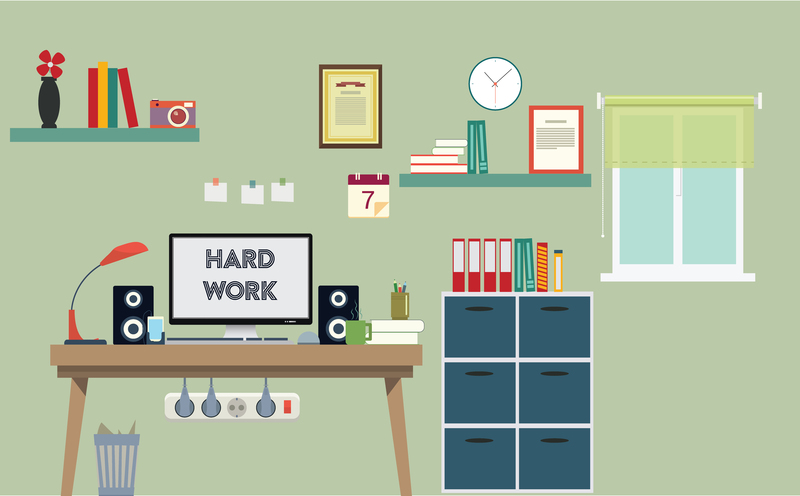 However, if you have determined that working from home suits your lifestyle, the next step is to figure out, which opportunities are the best fit for you. Both kinds of employment are available virtually and both have their pros and cons. Being an employee usually means that you only work for that specific employer, have regular hours, and receive benefits such as paid time off and, ideally, health and retirement benefits. In most cases, the employer will furnish equipment like laptop and/or telephone. As an independent contractor, you provide services to an organization but are not their employee. As such, you are not eligible for benefits and mostly have to furnish your own equipment. But you can also set your own hours and only work when you want to. This set-up provides ultimate flexibility and you can work for several organizations at the same time. The majority of work at home opportunities will fall into this category! Where to find legitimate work-at-home jobs? 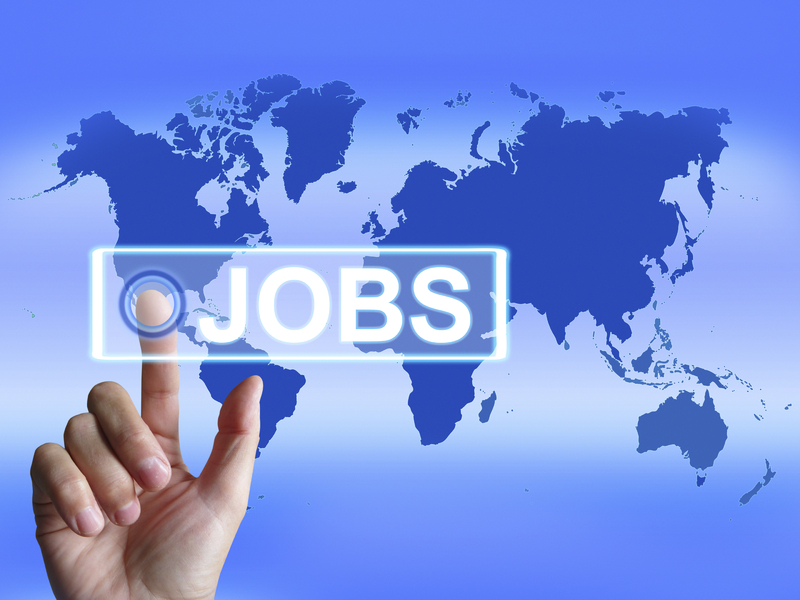 There is a one-stop-shop for virtual job postings. Your first go-to website should be Rat Race Rebellion. It’s not the most user-friendly site, but in turn it is free. Rat Race Rebellion provides the most comprehensive list of links to legitimate work-at-home opportunities of all kinds: employee and independent contractor, large and small companies, from healthcare to education to call centers, it covers every industry. Another legitimate website is Flexjobs. Flexjobs’ mission is to provide flexible work opportunities, not just virtual ones. Therefore, a lot of their jobs are actually not work-from-home, so you have to dig through their listings to find the virtual opportunities. You can browse the listings for free, but in order to get company name and contact information you have to join flexjobs, which charges you a monthly fee! Therefore, browse the listings first in order to determine if it is worth for you to join. Last but not least there are online market places such as Upwork and Workmarket. Upwork is literally an online marketplace where anybody can post projects that they need to hire somebody with a specific expertise for. Project posters are often individuals, small companies, or start-ups. On the flip side, contractors can sign up and advertise their services. Projects cover a wide range of fields: creative, legal, translations, software and web design, proofreading, accounting, etc. You can browse the jobs without registration. But in order to bid on/apply for the projects, you need to register and create a profile. Unless you have a rare expertise or skill, it takes some time before you can make decent money on Upwork. You need to build a good reputation project by project. Once your reputation is established, you can demand more money. It is pure supply and demand. Upwork can be great for people wanting to break into a new field or who want to build a portfolio of projects. It is also a good resume filler for people who are unemployed and want to avoid long gaps in their work history. Workmarket is also an online marketplace, but the projects posted are usually by larger employers. You can’t just browse jobs on the site — you have to register before you can proceed. Since the jobs are by larger employers who have an urgent short-term need, the pay is usually good. Both Upwork and Workmarket only provide contract work, not employment. If you want to move ahead with getting an online job but don’t know how to proceed, the Career Center can help. Give us a call at 225-231-3733 and we will help you discover options and tackle applications. This is the second post in a series of posts about the most common and damaging mistakes jobseekers make. Read the entire series here. You’ve been job searching unsuccessfully for a while and are getting desperate. When talking to your contacts, you tell them you just need a job, any job, because any income is better than no income. Great, your friend Joe tells you about a lead he has for you. His friend Jane owns a janitorial company and they need an evening supervisor. Joe tells Jane about you and facilitates a meeting. Perfect! But wait – you don’t want to work in janitorial services, that is not your field, and you don’t want to work nights. You have no interest in this job, which is what you tell Joe. What just happened? Joe lost face with Jane and you burned a bridge with Joe. Both are unlikely to help you in your search again. After all, you told Joe “any job” would be fine. Most people are happy to help. But you want to make it easy for them to help you effectively. When you talk to people about looking for a new job, let them know what kind of position you are looking for and what you can contribute to your future employer. It could sound something like this: “I’m an experienced HR Generalist with special expertise in employee relations and recruiting. I help companies avoid legal proceedings by proactively addressing possible legal compliance issues. I also enjoy recruiting and sourcing the best possible candidates for my company. Ideally I would like to work in an industrial setting here in the area, like a chemical plant or industrial construction company. I have experience recruiting skilled craft professionals and could make an immediate contribution”. Now Joe would know not to ask Jane for a job for you. Instead he would concentrate on his contacts in the chemical and industrial construction industries, as well as in Human Resources, and facilitate meetings with them. Now that you are clear about all of the above, you can start a targeted job search, identify the sources that are most likely to yield the best leads, and strategically contact your network. If you need help assessing your skills and values, or devising an efficient job search or networking strategy, call the Career Center at 225-231-3733, and we can help. 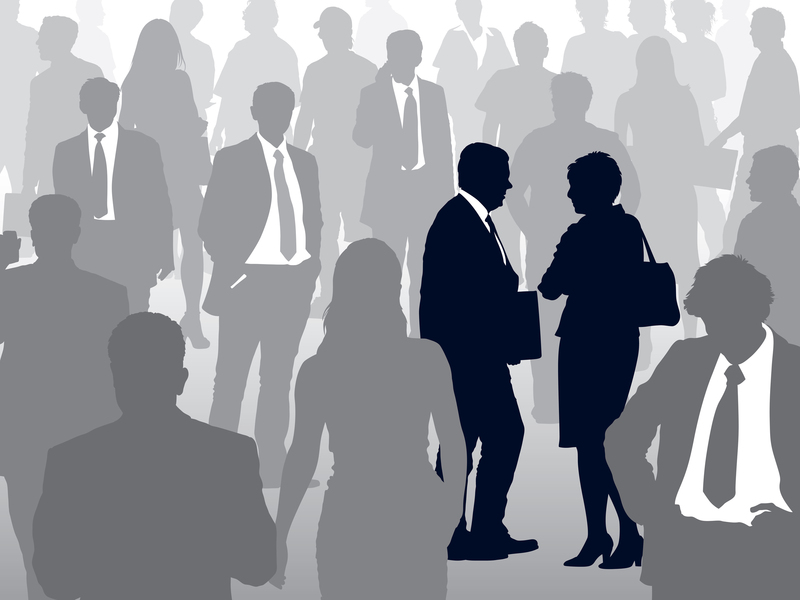 More information on networking and informational interviewing can be found at The Muse. This is the first post in a series of posts about the most common and damaging mistakes jobseekers make. Read the full series here. You find yourself out of a job and turn to what has worked for you in the past. After all, the last time you looked for a job, you grabbed the Sunday paper, found an ad in your field, sent a resume, went on the interview, and got the job. The problem is, that strategy stopped being efficient years ago. While you still find job ads in the Sunday newspaper, they have mostly migrated online. The online version of your local paper will still have job ads. Add to that a large number of online job boards, such as Indeed, Ziprecruiter, and Craigslist, plus local and niche job boards. That should give you plenty of jobs to choose from…..so you think. While you will find plenty of positions advertised on the internet, what’s your actual chance of landing a job this way? Many sources say: around 5%. Only around 20% of all open positions are advertised online. The other 80% of open positions are filled through referrals and networking! So, if your entire job search consists of applying online, you are competing for only 20% of available jobs. For non-technical positions it is not at all unusual for 200 or 300 people to apply. That’s a lot of competition. Your application is received by an Applicant Tracking System (ATS), the software the company uses to manage their recruiting function. The software often screens your resume and application before a human eye will see it. It uses keyword matches. If your resume does not contain the right keywords, you’re sorted out and your application will never be seen by a human. If a human recruiter screens your resume, they will look at it for only a few seconds due to the large number of applicants. They will not read your documents word for word! Due to the keyword-matching mechanism, the only applicants who will make it through are those who have the exact experience and skills described in the ad. If you are a career changer or want to change industries, you are very unlikely to make it through. It is still possible to find a job through online ads. Just use it as one of several approaches to job search, not your only one! Devote much more time to networking and informational interviewing in order to open up the 80% of open positions that constitute the hidden job market and are never advertised. If you need help devising an efficient job search or networking strategy, call the Career Center at 225-231-3733; we can help. More information on networking and informational interviewing can be found here.